I fell in love with reading because my mama read to me when I was young. It wasn't just bonding time, it felt like a special reward. I remember feeling like I had been so good that Mom wanted to share another world with me in addition to the real one. 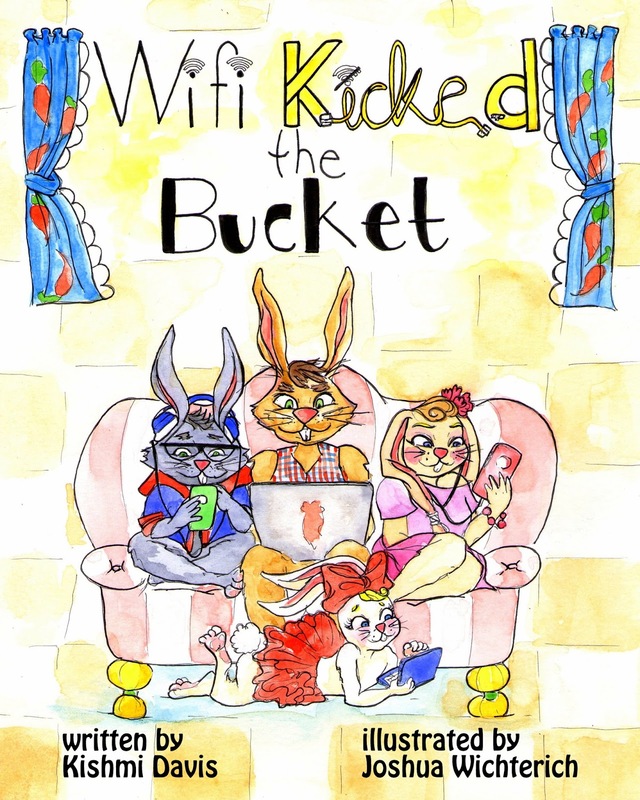 So, I decided to share something a little different with you when I heard about Kishmi Davis' book, Wifi Kicked the Bucket. and has taught for 14 years. Kishmi is a member of the North Star of Texas Writing Project, Society for Children’s Book Writers and Illustrators, as well as Children’s Book Insider. She now lives in Ellis county with her three children and guinea pig. Although I could read at age 3 and had a great imagination, I didn’t like school very much until 3rd grade. Prior to 3rd grade, I had separation anxiety and was anti-social. Mrs. Jones, my 3rd grade teacher, changed all of that. She noticed me. She noticed that I was quiet but fluent in reading. She put me to good use helping out struggling readers in my class. She allowed me to be an example. Allowing me to help others built up my confidence as well as the confidence of my peers. Mrs. Jones inspired me to become a teacher. I like to recognize and encourage my students especially those students who go unnoticed. It encourages them to come out of their shell and lets them know that someone cares. Take it from me, it means a lot when someone notices you. 2. How do you juggle teaching and writing with being a mother? What has been the hardest part of this juggling act? To me, being a teacher and a mother are interchangeable. Sometimes, I am a mother to my students, and I am also a teacher to my own children. Fortunately, I’ve been blessed to have the best children in the world. I have a 16 year old, a 12 year old, and my youngest is 10 years old. My children are understanding and supportive when it comes to me teaching and allow me to do what I need to do in order to prepare. This can be anything from me staying late and working in my classroom to me grading stacks of papers at home. My children do, however, have one requirement, and that requirement is that they do not have to stay late at school with me. They prefer to be at home while I am working late hours, and they are responsible and old enough to take care of themselves and their responsibilities. It’s not a perfect plan, but it works for us. The hardest part of juggling teaching and motherhood has been the time spent away from my children while I work at school. I usually try to make it up to them on the weekends with fun Fridays and quality time on Saturdays. 3. Please tell us about being nominated for Teacher of the Year. Being nominated for teacher of the year by my peers was such an honor. Even though I didn’t get the final award, it was nice being considered. There were several teachers who were nominated. We all work very hard and support each other. The teacher who received the Teacher of the Year award is awesome, works very hard, and deserved it. 4. What inspired you to write Wifi Kicked the Bucket? 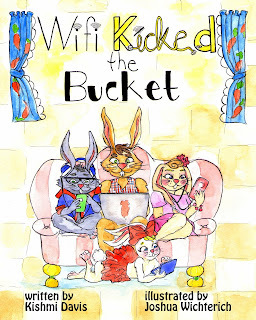 My children’s book, Wi-Fi Kicked the Bucket, was inspired by my three children. In the summer of 2016 the router to our Wifi stopped working. The reaction from my children was astounding. They literally did not know what to do with themselves in the beginning. They were in a bit of a panic state because they were not quite sure how to entertain themselves without their devices. After observing their reactions, I purposely took my time in replacing the router. I needed to know if they would ever ‘figure’ out other ways to occupy their time. It took a little over a week before they stopped begging me to fix the wifi and created their own fun. As a result, they talked more with each other and played games together. They even built forts! I eventually replaced our wifi router, but now I unplug it often to force them to take a break and spend quality time together. My advice for aspiring authors is to get started and know that your story matters! The hardest thing to do is to actually begin the process and stick to it. Once you get started and stay persistent, the rest will fall into place. If I could be any animal, I would be an eagle. Eagles fly alone at very high altitudes and have strong vision. They can focus on something up to 5 miles away. And my most favorite thing about eagles is that they love a storm. When clouds gather, eagles get excited. It’s been said that the eagle uses the storm to lift itself above the clouds. If I could have a fraction of an eagle’s characteristics, it would ensure that I become a successful person. Eagle information was found from http://www.bereanpublishers.com/7-principles-of-an-eagle.